After a string of good to great vintages, capped by the stunning, future legendary years of 2009 and 2010, Bordeaux has suffered from three difficult years in a row. Of course the term difficult means different things to different people. In Bordeaux, difficult means a small vintage that with selection, the top estates can produce wine that ranges from OK to fine, in a light, early drinking style. Consumers, who are the wines needed to buy the wines would not cling to the term difficult, especially when it comes to 2013 Bordeaux. Their view would to be put it charitably, would not be nearly so polite. Bordeaux wine lovers have grown spoiled with so many good vintages in a row. Chateau owners at the top estates have full wallets and the negociants have been happy as well. However, three years in a row of wines that were hard to make and even harder to sell has put a strain on everyone. The annual En Primeur tastings are expected to be lightly attended as consumer interest is at best moderate. Of course, that can all change once the report from Robert Parker on 2013 Bordeaux comes out. But for personal reasons, Robert Parker is traveling to Bordeaux in May, instead of March to taste the wines. His report will come out in June. When a vintage has demand this low, hopefully the wines will have already been priced, offered and with luck, sold by the time Robert Parker offers his views. Based on the weather, 2013 Bordeaux is a bad year, with unripe fruit. 30 years ago, a vintage like 2013 Bordeaux would have been a complete disaster. But today, the best producers with the time, money, drive, technology and terroir have the ability to make decent to good wine in any year. Bordeaux fans should expect most chateau to perhaps declassify as much as 50%, 60% or even 70% of the harvest and release very small amounts of their Grand Vin. What happened with the growing season and harvest for 2013 Bordeaux that produced a vintage this difficult? 2013 Bordeaux suffered though the coldest, wet, start to a growing season in more than 40 years. On the bright side, which is not very bright, the intense cold held back potential diseases in the vines. Sadly, most of France was experiencing cold, wet weather. These types of vintages come with the risk of rot and coulure. Coulure does not allow for the smaller grapes to develop. April was mixed. Bud break was late. The cold, wet weather returned in May with a vengence. May was wet. Normally, temperatures were on average close to 16.5 degrees Celsius at that time of year. To give you an idea on the cold spell Bordeaux was experiencing, temperatures were closer to 12 degrees Celsius. The cold damp weather along with a lack of sun continued slowing down the growth cycle pushing the flowering and the harvest date, further and further back. The only thing growing was the vines and leaves. Vineyard managers were having a hard time due to the low yields from a lack of grapes. Conditions were so bad at one point that some estates applied for the rights to use helicopters to spray the vines with a copper based treatments to cut down on mildew coupled with sulphur based treatments to fight against oidium. Bordeaux was in need of warm, dry, sunny weather by June as the harvest was already looking to be at least 3 weeks late by this point. The storm of June 8 could not have come at a worse time. Flowering began at most estates by the second week of June. However, many vineyards were beset by a poor fruit set and millerandage due to the difficult June weather. Vinexpo, the celebration of all things wine, especially all things Bordeaux saw cold, wet weather on a continuous basis. The closing ceremony for Vinexpo. Fete de la Fleur saw a down pour so fierce, guests were certain Noah was building an ark! July saw most growers feverishly green harvesting, hoping that the vineyards would dry out. But that was not what took place. First, heat spikes in July, coupled with excess moisture brought more fears of rot in the vines. However, the war, sunny weather put a short lived smile on their face. July 26 saw a massive storm slam into Bordeaux which left no one smiling. It was the worst storm to hit the Medoc since 1999. A massive amount of rain measuring close to 2 ½ inches flooded the vineyards in less than an hour. That torrential storm was accompanied by gale force winds that uprooted trees throughout the Medoc. The winds were fierce, much of the region experienced power outages throughout the weekend. Damage to the Left Bank could be seen as debris was scattered throughout the area from as far south as Margaux, where the tree in front of Chateau Palmer was uprooted all the way north to Pauillac, where the famous flag poles of Chateau Pontet Canet used to fly. Similar damage was also reported in Chateau Lafite Rothschild. Bordeaux could not get a break. A few days later, Bordeaux experienced a massive hail storm during the night of August 2. Parts of Cotes de Castillon suffered severe damage. Entre Deux Mers was destroyed! The hail storm of 2013 was said to be the equal of the last, devastating hail storm that slammed into the region in May, 2009. By mid-August, things were looking better. After one of the wettest, coldest, starts to a growing season in recent memory, Bordeaux, which enjoyed close to 3 weeks of uninterrupted, warmth and sunshine with temperatures close to 85 degrees. There was talk that the vintage was once again saved by an Indian Summer. Growers were hoping for the best, but preparing for the worst. The only thing everyone knew for sure at this point was the harvest would be small. Yields this small had not been seen in Bordeaux for decades. Out of the major grape varieties, Merlot suffered the most. Intense sorting was needed and once again, for growers that could afford them, optical sorting machines were seen all over Bordeaux. In fact, so many chateaux placed orders to rent optical sorters, they were quickly sold out. By the middle of September, vineyard managers were nervous, but happy as the warm weather returned. With fingers crossed and a lot of knocking on oak barrels for luck, everyone was hoping these conditions would continue and finally, their grapes would ripen. While hope was busy springing eternal, the good weather refused to cooperate and another storm slammed into Bordeaux at the end of September. With so much water everywhere, the fear of rot was rampant and growers made plans to pick earlier than anticipated. The prevailing wisdom earlier in the season was that picking would probably commence about October 8. That was no longer a possibility for most estates. 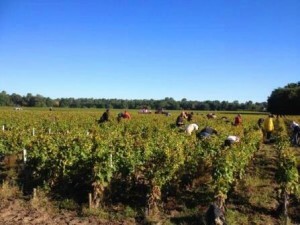 Bordeaux began harvesting their red wines grapes in earnest by September 27. In the Left Bank, as is usually the case, the Merlot was picked first. Growers began picking Cabernet Sauvignon by October 4. Finally, Bacchus gave Bordeaux a reprieve because conditions improved after the early October rains helping the Cabernet Sauvignon as much as it could. However, while favorable, those conditions were far too little, far too late. Early reports from growers stated the Merlot had difficulty ripening and bunches were packed with berries of differing colors and levels of ripeness. The Right Bank, especially Pomerol almost always picks before the Medoc. But that is not what took place with 2013 Bordeaux. Due to potential for botrytis, at times, it seemed like everyone from everywhere was busy picking at the same time. The situation becomes even more interesting when you consider that some chateaux in Sauternes were starting the pick the first of their fruit as well! Dry white Bordeaux from Pessac Leognan could also be very good this year, which could set a record as this means the white wine producers have made great wine for much of the past decade, if not longer. As is often the case when the vintage is moderate to poor for red Bordeaux wine, Sauternes and Barsac has a track record for making good wine. However, after so many great vintages for the sweet white Bordeaux wines in recent years, consumer demand for another Sauternes vintage is tepid at best. Interestingly, with 2013 Bordeaux, some producers in Sauternes were picking their grapes affected by noble rot at the same time estates with harvesting in the Medoc. That is almost unheard of! Yields will be low for 2013 Bordeaux wine. There will be much less wine in 2013 than Bordeaux has experienced for decades. Many chateaux will have at least 25% less wine to offer. The bigger issue is that yields for Merlot were miniscule in the Left Bank. The wines will be dominated by Cabernet Sauvignon. In a vintage like 1996, which was also dominated by Cabernet Sauvignon, that is not a bad thing, because the fruit and the tannins were ripe. In 2013, that is not the case because the Cabernet Sauvignon did not in most cases achieve ample levels of ripeness. Some producers will need to chaptalize with 2013 Bordeaux. That is not a bad thing. It was quite common a generation or so ago. But after an amazing string of great vintages, wine makers are not used to it. Still, alcohol levels should be quite low, especially when compared to vintages like 2009 and 2010.